Home » Cortezzzzzzz » This may be a fun couple of years. Apparently, this woman’s idiocy knows no bounds. 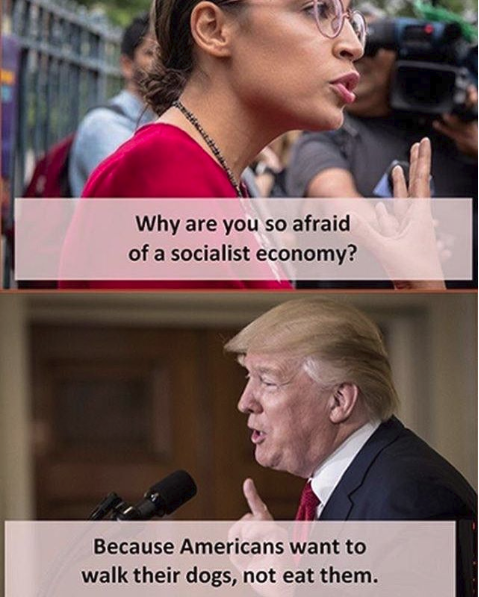 Putting aside her THREAT (which really shows her stupidity) and looking at her love of socialism we really have to wonder just what it is with these folks from NY who obviously cannot look at North Korea, Venezuela, Cuba, etc., etc., etc. and discern that communism DOES NOT WORK. Could it possibly be that these new American socialists are not so much interested in communism as they are in getting elected by appealing to the sin nature of natural man by offering that everything should be FREE? A source close to Donald Trump Jr. says that they expect an ethics complaint will be filed. ANd if you really want to see the state of education in this country and really want to get sick know this, this girl has an Economics degree yet apparently KNOWS NOTHING about economics (remind me to never send my children to Boston College) or much anything else. Almost immediately, numerous political analysts, commentators, and pundits noted that Ocasio-Cortez’s comments likely constituted an ethics violation. “It’s worth noting that the official House Ethics Manual explicitly prohibits the kind of threat that @Ocasio2018 just issued against @DonaldJTrumpJr for his refusal to support her political agenda,” The Federalist’s Sean Davis wrote on Twitter.